During research and development of advanced shot determination algorithms, we had an opportunity to conduct additional tests. These tests allowed us to acquire additional practical data to back-up previously published theoretical research concerning shot position determination errors due to Doppler Effect when sensors are in an open environment with the potential to be affected by wind. We set up a standard 8 sensor HEXTA target frame for the test. For the wind test the front corflute and the underlying rubber face were removed. This allowed the external environment to access the shot sensing chamber which would normally be protected from any external influences. Two identical tests were conducted, each consisting of a string of 18 shots from exactly the same location. The first test was performed with calm wind conditions. The second test was performed with a simulated crosswind blowing across the target face from left to right. The wind was generated by an industrial pedestal fan located approximately 5M from the left hand edge of the target. A wind indicator (similar to a flag) was located nearby the left hand edge of the target to give an indication of the wind strength. The shot impact points were monitored to ensure they were at exactly the same location at all times. The shot strings were performed with a maximum impact position variation of 1mm. The test set-up server captured each individual shot’s details for each string. The results were analysed using our specialised test equipment and the details for each string of shots are shown below. 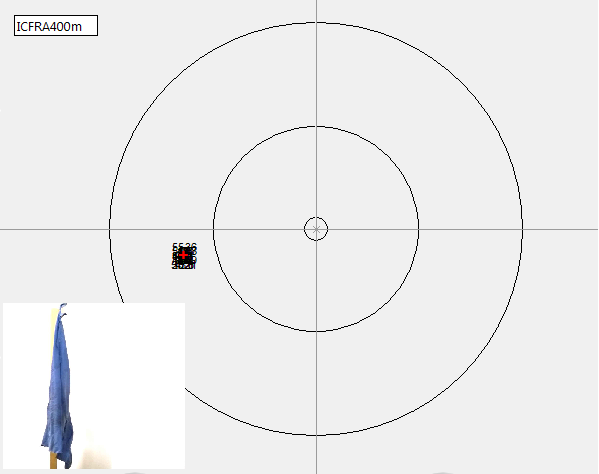 The shot examples show the response from all 8 sensors (56 shot location calculations). The error correction algorithm rejects the gross errors and brings the calculated point of impact to the most probable location for this situation. However when a crosswind is present the vector of error has the same direction for all sensors and it is impossible to quantify or compensate for such an error. The simulated wind from left to right across the target face has shifted the average group by 7mm to the right. 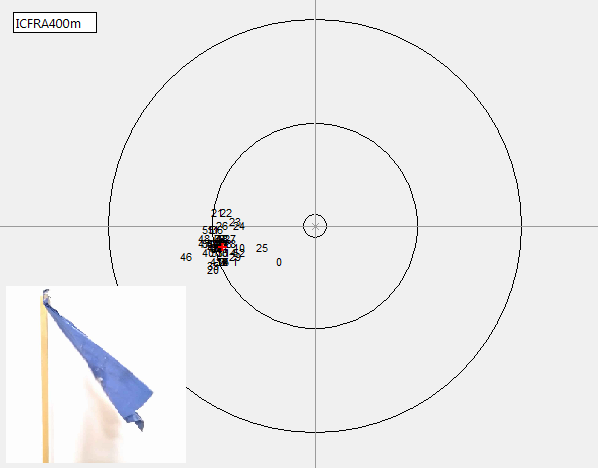 It can be seen on the shot plots that when the wind is blowing there is also an increased uncertainty of the shot determination in addition to the shift of the group. The degree of uncertainty has increased from 0.34mm to 2.03mm with 2cm for the worst case scenario. 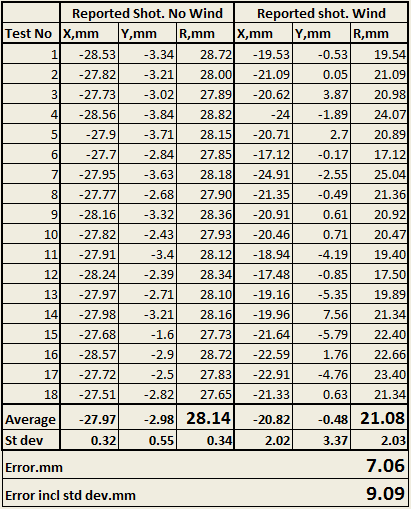 Therefore, the total shot determination error detailed in the table shows a variation from -0.34 to 9mm in most cases as the wind speed varies to the level as shown by the wind indicator displayed on the shot plots. Variations in projectile velocity will also affect the magnitude of described errors. Additional errors such as this plus the parallax error have not been taken into account during this test and are not shown on the plots nor in the tables. Ultrasonics and Turbulation Don’t Mix!